The extremely talented and lovely Kat Richardson tapped me for The Next Big Thing. Kat and I met at World Fantasy Convention a few years back, and we’ve kept in touch. She’s the author of the Greywalker paranormal detective series and a good friend. Elaine Cunningham also approached me for this, so I want to thank her as well. Elaine is the author of several series, including books for Forgotten Realms and the Pathfinder RPG worlds. I had the basic idea for this novel back when I first started working on the concept for the series. I knew that Caim would one day return to the land of his birth and confront the forces that had torn apart his family. 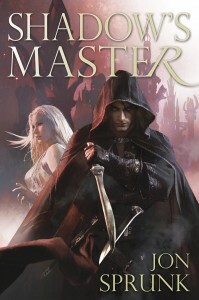 This book is Caim’s search for answers, and vengeance. Some call it “sword and sorcery” and Amazon lists it under “Historical Fantasy” (which it isn’t.) Let’s just say bloody, emotion-fueled fantasy. Oh, this is a hard one. I think Hugh Jackman would be a great Caim, or perhaps Channing Tatum. A young Kate Beckinsale would be my ideal Josey. Kit is the hardest one to pin down. She’s ethereal (literally) and irrepressible. Maybe Emilia Clarke, because she looks so good in Game of Thrones. For the Northmen, just recruit a band of drunken Nordic hooligans. I’m represented by the JABberwocky Literary Agency and published by Pyr Books. About four to five months. My series has been compared to the Night Angel series by Brent Weeks (who is an awesome guy, btw). If a book has magic and assassins, I’m down with it. I had to find out what happens to Caim. And I had a desire to write about a land of cold and darkness ruled by an immortal king. Well, it’s got plenty of action, Northmen (think brutal, landlocked Vikings), dark sorcery, a fae girl who wants to be human, and shadow-swordsmen, and battles galore. This entry was posted on Wednesday, December 12th, 2012 at 3:27 pm and is filed under Uncategorized. You can follow any responses to this entry through the RSS 2.0 feed. Both comments and pings are currently closed. Hell yeah. I knew the basic gist, but that was it. Caim never ceased to surprise me. I had to find out what happens to Caim. I find it interesting you wrote the book so that you, the author could answer this question.